Columbus Jazz vocalist Rachel Sepulveda will take The Woodward Opera House stage Saturday, April 27, with Vaughn Wiester’s Famous Jazz Orchestra for the ninth annual scholarship benefit concert. Admission to the 7:30 p.m. concert is free to the public on a first-come basis until capacity is reached. Reserved seating is available in advance to scholarship fund patrons and corporate sponsors. Celebrated Columbus jazz vocalist Rachel Sepulveda (above) will again join Vaughn Wiester’s Famous Jazz Orchestra for an April 27th scholarship benefit concert, to be staged for the first time at the Woodward Opera House. Vaughn Wiester brings his 21-piece ensemble to his hometown for what has become one of the most anticipated annual concert dates of the year in Mount Vernon. Making her second Mount Vernon appearance as featured vocalist with the Famous Jazz Orchestra will be Rachel Sepulveda, whose jazz talents extend beyond singing to arranging and conducting. The Knox County Foundation is collaborating with the Community Concerts Association of Knox County and Knox Partnership for Arts and Culture to present this evening of free big band music to the Knox County community, and to raise donors for the Foundation’s music scholarship named in honor of Mount Vernon native and renowned bandmaster Vaughn Wiester. The Vaughn Wiester Music Scholarship will be awarded for the ninth time this spring to an aspiring instrumentalist or vocalist who is a graduating high school senior residing in Knox County. Funds for the scholarship are being raised through the solicitation of individual patrons and corporate sponsors, and through voluntary contributions in any amount that will be invited from audience members. Due to ongoing renovations at the Knox County Memorial Theater, this annual event is being staged at The Woodward where seating capacity is less than half that of the Memorial Theater. Those wishing to secure reserved seating may contact the Knox County Foundation at 740-392-3270 during regular business hours. Vaughn Wiester with his Famous Jazz Orchestra. 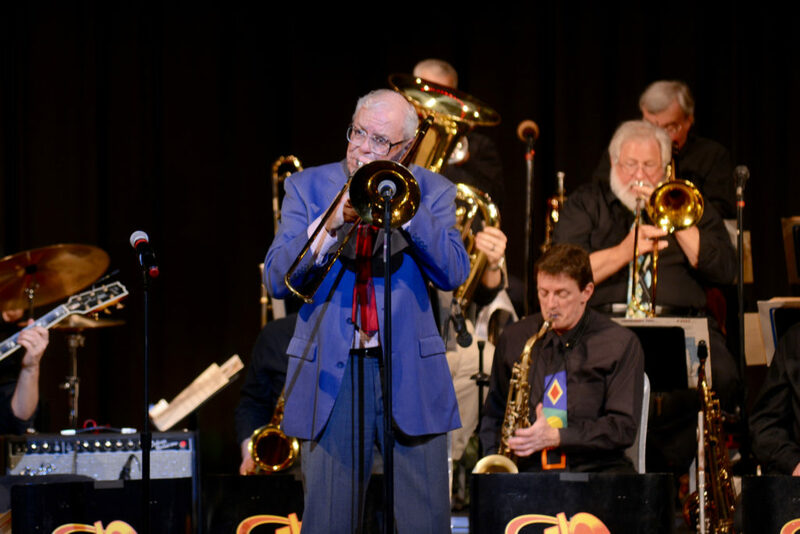 Vaughn Wiester’s Famous Jazz Orchestra is made up of 21 of central Ohio’s finest musicians who have come together every Monday evening on a semi-informal basis since 1997. They share their love of jazz playing their favorite big band charts. For fans, this is an opportunity to hear the sounds of Woody Herman, Stan Kenton, Count Basie and other great bands. Occasionally there are guest instrumental or vocal artists, or guest arrangers conducting their own arrangements. Many nationally known arrangers have been commissioned to write for the Famous Jazz Orchestra, including Bill Holman, Herb Harrison, Slide Hampton, Lennie Niehaus, Bill Dobbins, Paul Ferguson and Al Kiger. Members of the orchestra have played with orchestras of Glenn Miller, Guy Lombardo, Woody Herman, Mel Lewis, Tommy Dorsey, Ralph Marterie, and Buddy Rich, as well as Columbus bands including Al Waslohn, Doc Everhart, Bruno Masdea, Chuck Selby, Rick Brunetto, and the Columbus Jazz Orchestra. Many members have been on local university jazz faculties. While still a student, Wiester played and arranged for the Riley Norris Band. After a hitch as a Navy trombonist Wiester arrived in Columbus in 1968, attended The Ohio State University and joined the Dave Workman Blues Band. In 1972 he became a member of the Jazz Arts Group led by Ray Eubanks, and in 1974 he was invited to join the Woody Herman Orchestra. After two years on the road with Herman, Wiester returned to Columbus to accept a position at the Dave Wheeler Contemporary Music Workshop and to resume his activities with the Jazz Arts Group as a bass trombonist and arranger. In 1977 he was invited to join the faculty at Capital University as part of their pioneering Jazz Studies degree program. Throughout this 17-year association, he taught courses in jazz arranging and jazz history aid directed the prize-winning Big Band Sound Big Band. In 1980 he joined the Terry Waldo Ragtime Orchestra. For more information about the Knox County Foundation or the Vaughn Wiester Music Scholarship, please visit www.mvkcfoundation.org.